5 Bedroom Detached House For Sale in Preston for Offers Over £325,000. 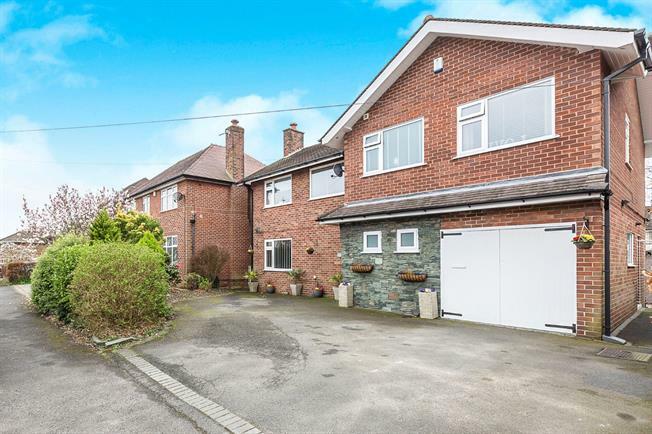 An outstanding contemporary five bedroom detached family home offering fabulous high quality fixtures and fittings throughout and a deceptively large spacious living accommodation. An internal inspection is highly recommended. The exceptionally well proportioned accommodation briefly comprises of an imposing entrance hallway with staircase leading to the first floor. The light and airy cosy living room benefits from a beautiful floor to ceiling window overlooking the rear garden creating a spacious atmosphere perfect for day to day living. The gorgeous contemporary family fitted kitchen designed by 'Insignia' has a host of integrated Siemens appliances whilst mirroring this is a formal dining room with patio doors, perfect for bringing the outside in and enjoying views across the garden. Added touches of convenience include a downstairs WC and two large storage cupboards. Upstairs, you will find five generously proportioned bedrooms across a split level landing; the master bedroom providing a luxury en-suite shower room. There is also a luxurious family bathroom too. To access the first floor there are two staircases, one leading from the main entrance and one leading from the inner hall off the kitchen. Externally, the property is situated on a larger than average plot accessed via a hard-standing tarmac driveway leading to an integral single garage. Beyond this point, the rear south-facing garden is very private with tall mature hedging, a beautiful lawn, patio, and two sheds. View to appreciate. Composite entrance front door with frosted uPVC double glazed side panels. Double glazed uPVC window facing the front on the stairwell. Radiator, tiled flooring, under stairs storage, ceiling light. Double glazed uPVC window with frosted glass facing the front. Radiator, tiled flooring, ceiling light. Close coupled WC, vanity unit and porcelain sink. UPVC sliding patio double glazed doors which open onto the garden. Radiator, laminate flooring, ceiling light. Double glazed uPVC window facing the rear overlooking the garden. Radiator, vinyl flooring, ceiling light and under unit lighting. Wall and base units, stainless steel one and a half bowl sink with mixer tap, integrated Siemens electric oven, integrated Siemens microwave oven, Siemens gas hob, Siemens stainless steel extractor, integrated slimline Siemens dishwasher, integrated washing machine, integrated fridge/freezer. UPVC double glazed side door. Radiator, vinyl flooring, built-in storage cupboards, spotlights. Door to garage, staircase leading to the first floor. Double bedroom; Double aspect double glazed uPVC windows facing the front and side. Radiator, carpeted flooring, ceiling light. Double glazed uPVC window with frosted glass facing the front. Radiator, vinyl flooring, part tiled walls, spotlights. Close coupled WC, corner shower, vanity unit and top-mounted sink, extractor fan. Double bedroom; double glazed uPVC window facing the rear overlooking the garden. Radiator, carpeted flooring, built-in wardrobes, ceiling light. Heated towel rail, vinyl flooring, part tiled walls, spotlights. Close coupled WC, double ended bath with mixer tap, double enclosure shower, wall mounted sink and vanity unit with mixer tap, extractor fan. Double hardwood doors. Power and light. Door to utility area.